Apparently crab rangoon is quite the popular appetizer at Chinese restaurants in America. I’ve never discovered crab rangoon on a menu here in Vancouver, but on a trip to Chicago last year, I saw it on every Chinese restaurant menu we saw. For some reason I find saying “crab rangoon” immensely hilarious. Whenever we pass by a random Chinese restaurant in the states, I drag Mike over, point and the menu and yell out “CRAB RANGOON!” like a five year old. In Chicago, saying “crab rangoon” over and over again reminded me of the name of the bad guy in Batman Begins. For the life of me I couldn’t remember what his name was. Even though I kept pestering Mike, he refused to tell me. Then, in a moment of brilliance at dinner, my brain synapses flashed and I remembered: Batman’s mortal enemy is Ra’s al Ghul! Is it just me, or does Ra’s al Ghul’s name sound suspiciously like crab rangoon? Ra’s al Ghul aside, I knew I had to make crab rangoon one day. I found this super easy recipe on kraft.com and went to town. Instead of the canned crab, I bought fresh. I also dialled down the cream cheese and added sriracha for kick. 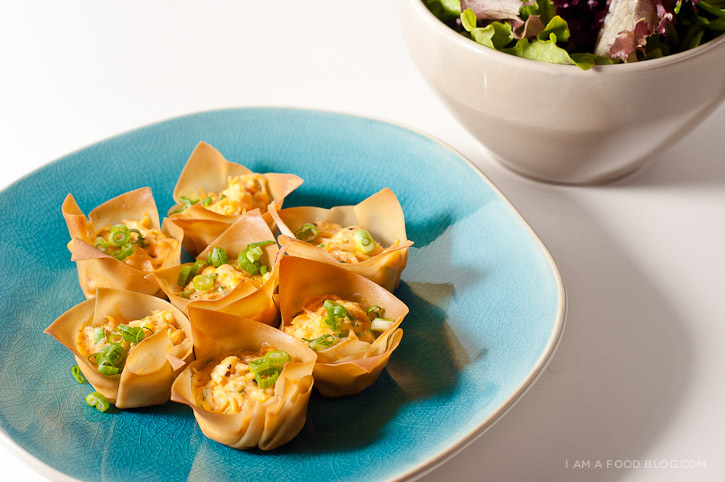 The rangoons came out perfect: addictive crisp cups filled with creamy, spicy, crabby insides. 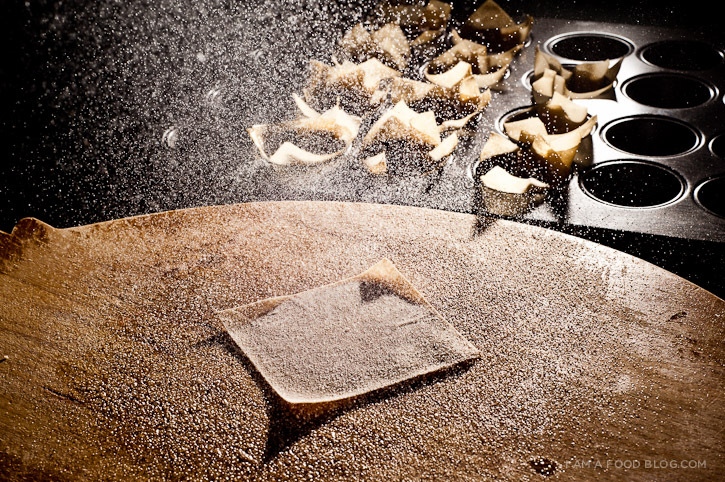 i am crisp, i am crabby: i am crab rangoon! Preheat the oven to 350°F. 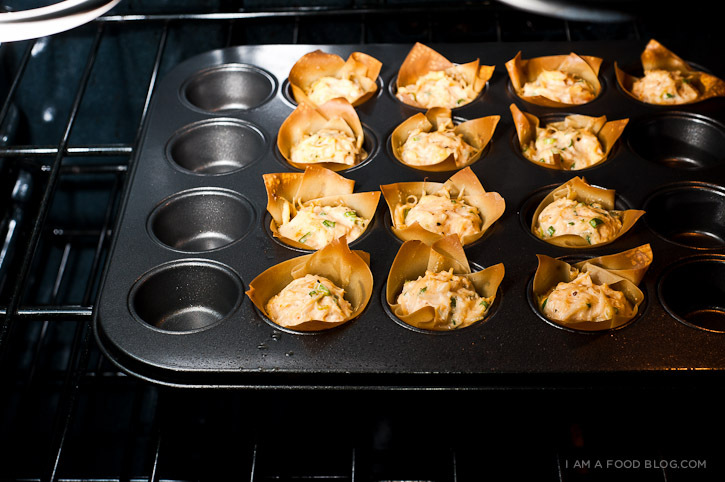 Lightly spray both sides of the wonton wrappers with cooking spray and place in a mini muffin tin. Throughly mix together the cream cheese, mayonnaise, lemon juice until smooth and free of lumps. 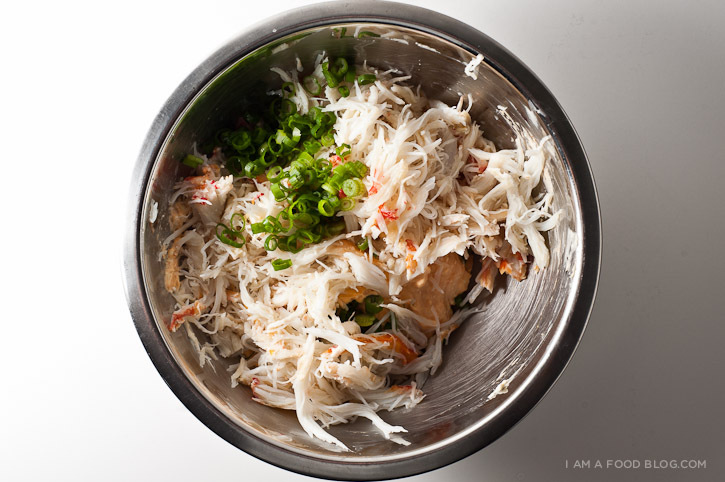 Add the crab and 1 tablespoon green onions and fold in. Season with sriracha and freshly ground pepper. Spoon about 1 tablespoon of filling into each of the cups and bake 15-20 minutes or until edges of cups are golden brown. (Keep a close eye on the cups as the wrappers can toast up quickly). Top with remaining green onions. Enjoy warm. D: why does everything on your blog look SO DELICIOUS?! Love the recipes, love the blog!!! This looks de-li-cious!! I love your blog so much! It is such a visual stunner!! 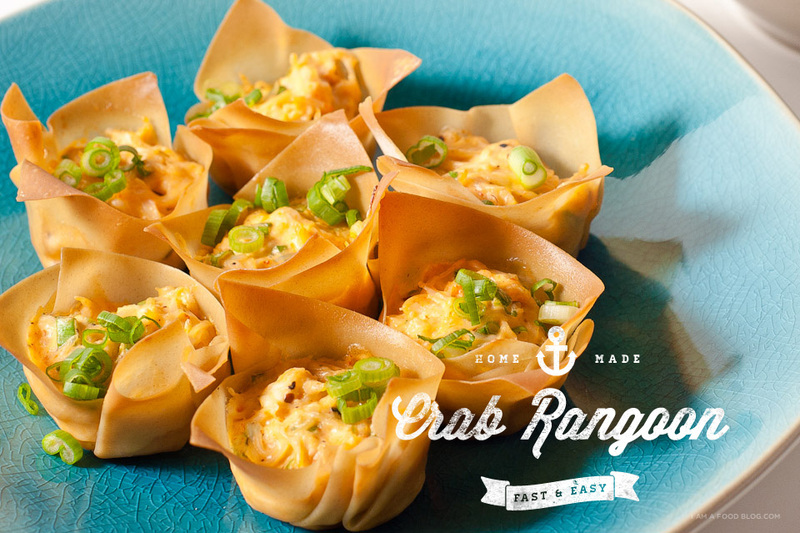 Crab ragoon is my staple food when ordering Chinese takeout – now I can make them myself! Love the photos, graphics, everything here – excellent blog. Just found your blog and am loving it. Keep up the good work – must dash off and eat something now! These are fantastic! 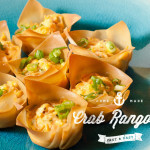 My new favorite crab rangoon recipe!! Thank you!! I found this post while I was working on one of my own blog posts (also crab related). The format and design you have going are pretty awesome, as functional and attractive a food blog as I have come across so far. These look delicious and fully stuffed. Nothing worse than biting into crab rangoon and there’s little to no filling. Ruins my day.